A traditional Book of Shadows is a hand-written tome that contains all relevant teachings you have received throughout your training. 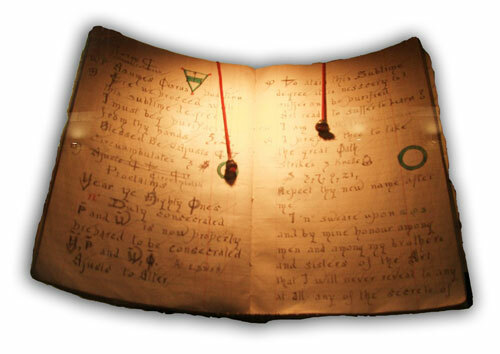 The content of each Witch’s Book of Shadows is unique to each practitioner and their path. It is distinct by tradition; the teaching materials of that tradition, oath bound rites or initiations of the tradition, spells and its liturgy. The importance of your Book of Shadows as a living breathing compendium of spells, rituals and traditions of Witchcraft, cannot be overly stressed. It becomes your legacy. Now in the 21st century the Book of Shadows takes many forms; from the traditional handwritten book to an electronic book, the printed book that can be purchased in its entirety, a three-ring binder or a blank artist’s sketch book. Either way, ideally it also contains all the basics of Witchcraft; correspondences, moon phases, timing, days of the week, colors, invocations, spells, runes, condenser fluids, seals, etc.… In its entirety, its contents can be used to teach others. Historically, it was customary that the Book of Shadows be burnt with the owner upon their death, which explains why we have not found more of them. More recently, it has passed down to the next in line for priesthood, the coven, a student, or a relative. The Witchcraft that you practice will be unique to you – unique to your experiences, teachers, travels, education, and all else your life consists of. You are allowed to worship and practice the way you see fit. I am here to guide you along this stage of your journey. Most of the information I make available to you here is from my personal Book of Shadows, all of which comes from my personal occult studies. I offer this information – spells and Witchcraft training – to you because this is the time, and we are the ones. Join me on the magical path of spell work to shape and form your dreams one spell at a time. Much of the information I make available for you here is derived from course work taught by my first initiating Priestess Kim Landers at Adriel’s Alchemy. No Spam. Not Now, Not Ever! The ‘New Age’ term, Book of Light, is a name given to the Book of Shadows by those who are afraid of their own power. This is a more palatable term for some. Shadows are scary. It is in the shadows that all our significant personal work is done. Another term for deep personal work is ‘Shadow Work,’ which is a term used in Jungian psychology. Basically, a Grimoire is a magician’s manual for invoking demons or the spirits of the dead. This reads more like a textbook. It contains the precise instructions that are needed for these operations. The working principals of all magic are based on information that is found in The Kybalion by The Three Initiates [link to Amazon]. These principals are the same regardless of the practitioners religious and spiritual practices. These working principals are very basic: What you send out returns to you in like kind. This is the basis of magic. This is what the law of correspondences is based on. It is important to be ever mindful of the spell work you choose to do, but most importantly, observe why you are doing the work. Intention is everything in magic. Your purpose must be clear to you. And remember, be careful what you wish for, you just might get it! Great Success to All Your Workings! Practitioner’s Tip: Read everything you can get your hands on. Put to practice what you learn. What doesn’t suit you, with a breath of kindness, blow it away.